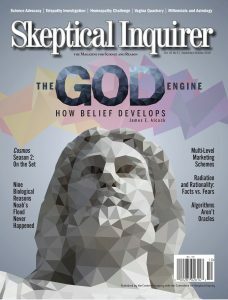 In the September/October 2018 Skeptical Inquirer, three articles made related mistakes. One, by James Alcock, was based on the common belief that religion is highly popular and enduring because it is a natural consequence of the way brains work from childhood on up. Gregg Davidson and company asserted that because little if any progress is being made concerning the popularity of creationist belief versus evolutionary science in the United States, effective methods must be urgently developed and deployed to improve the situation. Third, Lorence Collins stated that nearly half of Americans think our planet is just ten millennia old. As for the first assertion, to confirm that juvenile-derived cognition plays a big role in the popularity of theism in adult populations, the hypothesis must be compatible with and convincingly explain the large-scale demographics of atheism and theism. Yet Alcock presents no statistical data relevant to the popularity of theism versus atheism either longitudinally over time, or laterally over nations, to confirm or deny his psychology-based hypothesis. It is a hypothesis that would not be taken seriously in, say, Denmark, where most are casual atheists to one degree or another. As for Davidson et al., they failed to cite the survey results showing that support for Darwin’s Dangerous Idea is rising rapidly at the expense of creationism in these United States and is doing so largely because American atheism is growing by leaps and bounds in direct contradiction to the errant idea that religion is the normal human condition. Nor does survey data support Collins’s contention that so many Americans are so profoundly deluded.